A sad postscript to "My highs and lows of transgender advocacy." In my blogpost of a couple of days ago, I touched on some of the things that lift me and those that, well, shoot me down. However, I have not been able to get one thing out of my mind since I received the news on Sunday evening. Let me explain. 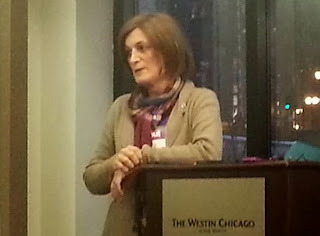 At last week's Gay Christian Network (GCN) Conference in Chicago, I met Betsy, a fellow Canadian. She attended as an ally and we had a long chat about an old friend from her high school, who like me, transitioned from male to female in her fifties, Amanda. She shared how Amanda had friends who supported her but these relationships had slowly cooled and Betsy was concerned for her friend. She thanked me for my work and was looking forward to being a more informed friend of Amanda. The note I received from Betsy on Sunday night was short; Amanda had ended her life. My highs and lows of transgender advocacy. Sometimes I preach to the choir, sometimes to the genuinely curious and sensitive; at other times to hostile skeptics, but often to myself. I had the distinct honor and privilege to do a workshop at this year's Gay Christian Network Conference (GCN) last weekend. I cannot begin to describe what it is like to be among 700 attendees who have one thing in common, a hunger and a love for God, and for whom faith is not a legalistic dogma, but a the river of life.